Everyone is in for a special treat as we close out 2018 with a workshop with the founders of 3 Fish Studios in San Francisco. Participants will have the opportunity to explore printmaking techniques with the creators of the iconic Rex May San Francisco road sign and the brown bears hugging the state of California prints. Eric Rewitzer and Annie Galvin are printmakers and painters, husband and wife, and founders of 3 Fish Studios. 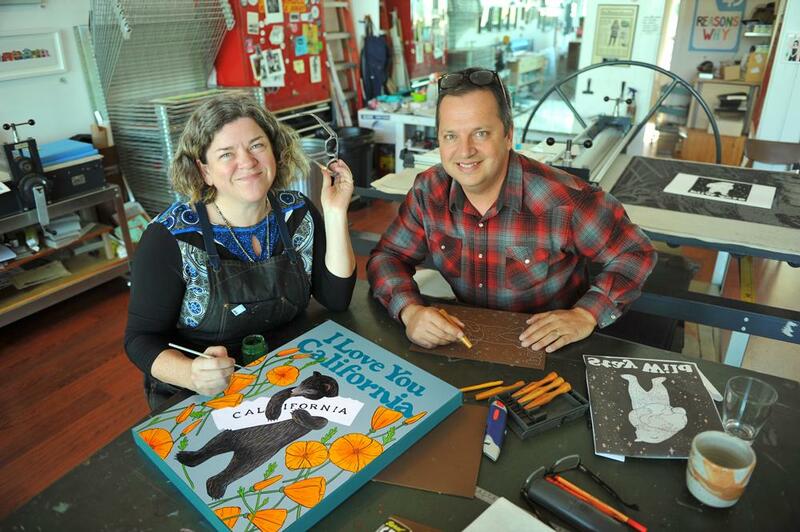 Together they make original artwork focused on prints featuring California-related themes. They are very excited to share the fun of printmaking with all of our participants in this workshop. We will be hosted by Collective Health in San Francisco. Collective Health works to give companies a smarter alternative to traditional health insurance. When: Sunday, December 9th, 2pm - 4pm.